Need room for shampoos, conditioners and soaps? Our full line of HYDRO-BLOK shower niches are what you need. With a wide range of sizes and styles, we have one or maybe two that will fit your dream shower design. 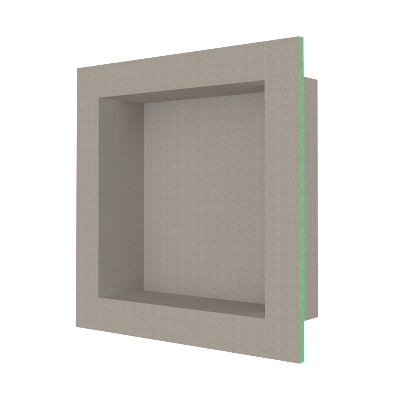 All of our recessed niches are constructed from a single piece of 100% waterproof XPS foam and then covered in fibreglass mesh and coated in a modified cement coating. This high quality construction means these niches are built to last with no leaks. Cover them with your favourite tile or stone and they will look great and be a handy addition to your shower. Our HYDRO-BLOK Shower Niches do not require any modifications to your 16″ OC wall studs, making installation quick and simple. Our smallest recessed niche is 16″ x 16″, but not small in convenience. This recessed shower niche can hold several bottles and accessories, making your shower a more organized place. This niche and the rest of our product line can be easily and quickly installed in most shower applications. Fits any standard 16″ OC wall stud spacing. Check out our HYDRO-BLOK Shower Niche install instructions for a perfect fit every time.